Inspiring Art Teachers to Explore Art History | Curator’s Corner: Holy Cats! I’m always interested in how important of a role domesticated animals have played in the history of art, particularly in the sphere of funerary art. They almost always take on a protective or strength aspect. 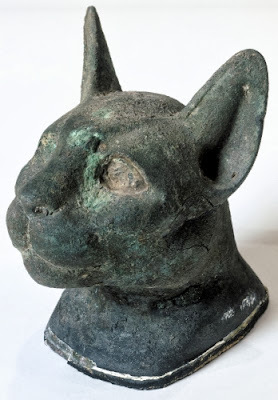 We just added this noble cat head from ancient Egypt to our group of images from the Albright-Knox Art Gallery. Cats in Ancient Egypt were the sacred animal (familiar) of the goddess Bast (or Bastet). Bastet was an old cat goddess venerated in Bubastis, capital of the 18th province in Lower Egypt. She protected pregnant women and was patroness for singing, music and dancing and thus very popular. She was depicted as a woman with a cat's head, or just a sitting cat but originally wore a lioness' head. In depictions she can be seen as a cat with a mask of a lioness (with rounded ears) in her hand. Many mummified Bastet cats have been found from all times. Egyptians mummified animals sacred to various deities, including alligators and snakes. Amulets and figurines of Bastet were very common showing her popularity among the all Egyptian social classes. Her festival was the peek of the year for her worshippers since she also was protector of love, joy and pleasure. During the New Kingdom she had a lion-headed son with the god Ptah: Maahes. This cat is a funerary object. It is like part of a coffin for a kitten or cat. It also may have been attached to the coffin of a person who particularly venerated Bastet. 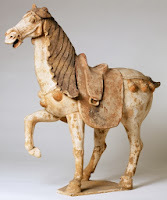 The horse has been revered in many cultures world-wide, and was especially venerated in China. 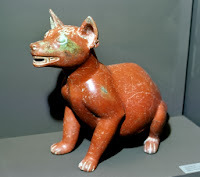 During the T’ang Dynasty (618-907 CE) there was a proliferation of the number of ceramic objects placed in tombs to help serve the deceased in the afterlife. The horse was very popular because it was the seventh symbol on the Zodiac (western). It also represented the qualities of practicality, love, endurance, devotion, stability, as well as quick advancement in rank and strength. In the Mesoamerican Colima Culture, the dog was a particularly valued being, just as it is in the contemporary world. They were valued as protectors as well as companions. Some dogs, like this one, were fattened for ritual sacrifice and eating. The small dog is thought to be a distant relative of the modern Chihuahua. Although the English did not bury works of art of their favorite animals with them, they certainly did immortalize them in art. 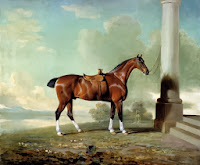 Like the Chinese, the English venerated the horse. 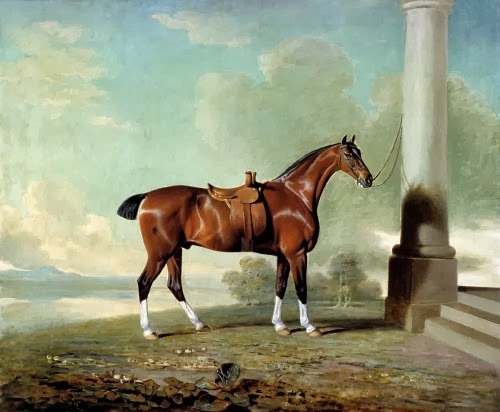 It became fashionable among the upper classes in the 1700s to have portraits painted of their favorite horse. They were sometimes depicted with a favorite groom or retainer, but often they were presented as iconic symbols of English virtue.